Admittedly, this blog post is a day late on Tuesday, instead of Monday as promised. But I thought it was important enough to post even a day late. If you're vigilant with your skincare, you're probably already doing his, but I'm sure as the weather has gotten colder this task gets lower and lower on your list. Of course, I'm talking about exfoliating. There are so many benefits to exfoliating, the main effect is that is gets rid of dead skin and allows the epidermis (aka the top layer of skin) to regenerate new cell without doing damage to it. This effects generates many benefits such as keeping breakouts at bay, it has anti-aging effects, improves the texture and evenness of your skintone. Lastly, by removing the dead layer of skin, it helps the next products you apply - like a serum, oil or moisturizer - penetrate deeper into your skin. And of course, this helps improve your skin even further - depending on what you need. 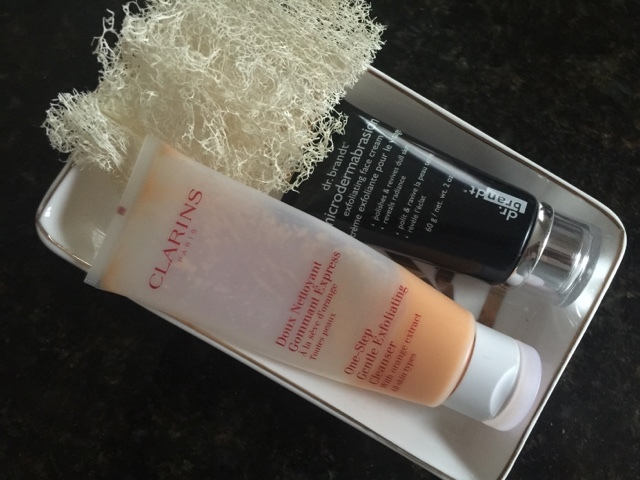 I've taken pictures of the products I'm currently using, and my favorite daily exfoliant is the Clarins One-Step Gentle Exfoliating Cleanser. It smells amazing, a light scent of oranges - which helps wake me up in the mornings, and it so gentle but effective. I generally exfoliate using a daily cleanser in the mornings. When I do a super intense exfoliating regime (about 1x a week) or exfoliating mask, I do that in the evening when I tend to have more time. An alternative daily exfoliant is the Korres Wild Rose Daily Brightening and Refining Buff Cleanser, I find it to be super effective and it smells great. 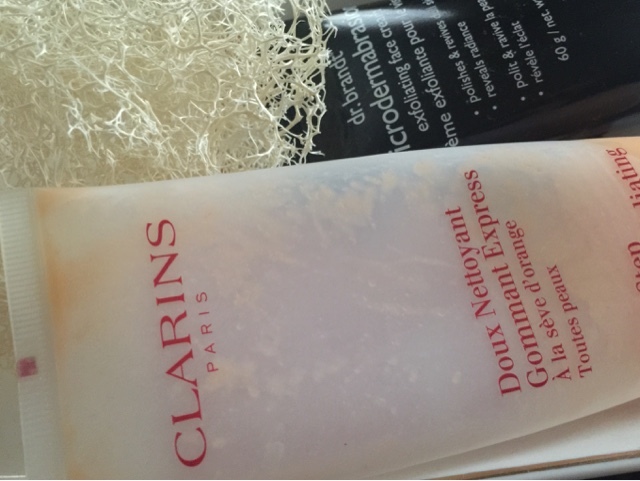 However, this one is different from my Clarins exfoliater as the exfoliating particles are not round balls but small pieces of rice grain and cherry stone. As a more penetrating (and harsher exfoliant) exfoliant that I use about 1 a week or biweekly - depending on my needs - I use Dr. Brandt Microdermabrasion Exfoliating Face Cream. This is a pricier item, and it was gifted to me, but it is very effective when you're looking for a deeper exfoliation. And, as I said before, this is something I tend to do when I'm pampering myself and have more time - like my evenings. Lastly, I exfoliate my body too, since I sometimes do get breakouts there. 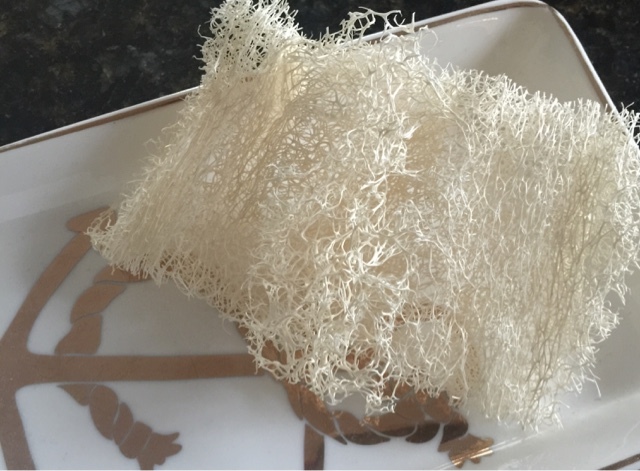 I use an all-natural loofah that you can get an an all-natural type of store and you can get even get plastic one or scrubbers from almost any drugstore. I got the one pictured above from a good friend. The great thing about the all-natural loofahs is that you can cut them to the size that you need. That's it for today! What are your favorite exfoliaters or cleansers?